The record is made up of Codex A collection of pages, usually gathered into quires, and bound between covers. ; ff. iii+262+iii. It was created in Rabī‘ I 570. It was written in Arabic. The original is part of the British Library: Oriental Manuscripts. 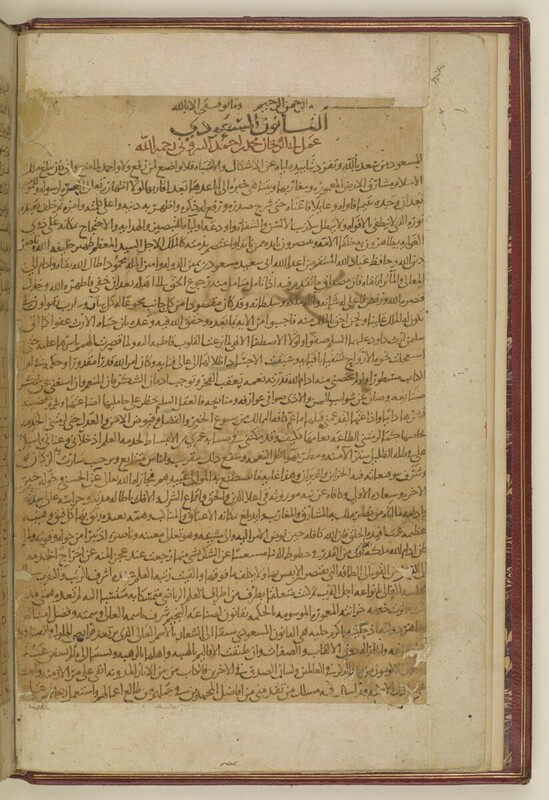 An early and complete copy of the comprehensive astronomical work, or Canon , by Abū al-Rayḥān Muḥammad ibn Aḥmad al-Bīrūnī (أبو الريحان محمد بن أحمد البيروني, ca 973-1048). The al-Qanūn al-M asʿūdī was dedicated to Sultan Mas‘ūd of Ghaznī (reg. 1030-1040), and summarises the astronomy of the Almagest (كتاب المجسطي) of Ptolemy (Claudius Ptolemaeus; c 90-c 168) and brings it up to date by adjusting stellar longitudes to account for the almost nine centuries elapsed between the two authors, and by adding astronomical advancements drawn from Arabic, Persian and Sanskrit sources. The copy was completed in Rabī‘ I 570/Sept.-Oct. 1174 in Baghdad by an anonymous scribe. The text is divided into 11 treatises (مقالات) subdivided into chapters (أبواب) and then sections (فصول). A detailed table of contents is found on ff. 2r-5r. Treatise Eleven (المقالة الحادي عشر) eleven chapters on astrology (ff. 242v-262r).